The best apple crisp in the world. It’s pure comfort food at its finest! Okay, so where do I begin…. This recipe is my Mom’s. Those who read regularly likely know my Mom passed away when I was a teenager. She was incredible. She also made the BEST apple crisp in the world. Up until now I’ve never shared it. I am still questioning whether or not I should. but because I messed this freaking thing up…. and I don’t want to show it to you…. 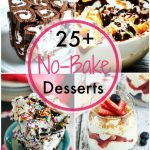 This past week I was posting every day, and up until the last post I had my recipes done well in advance and all perfect like. Then all heck broke loose here and I fell behind. So I made this apple crisp late last night. And I literally forgot one of the most important ingredients. Seriously! ruined apple crisp still tastes good on ice cream. Thanks Cheryl James. You rock my world. Today would not be complete without some memories. I do not have access to all my photos since my ‘puter is still in the shop but I found a couple and jazzed them up for you. Her deep love for family. Her love of cowboy boots. I hope you have an amazing Mother’s Day folks. I felt so thrilled yesterday when I noticed my parent’s lilac bush blooming in the back yard (we bought my folks home after my dad passed). The bush has been there as long as I can remember. I’m clipping some branches off and tying then in bunches to bring to the cemetery. Four bunches for Mom, and four bunches for Dad. One for each of us kids. It will be a nice way to do something for my siblings who don’t live here. I’m also bringing some clippings from my cherry blossom trees which are blooming as well. Those will be tied with ribbons from all the grand-kids. I think it will be so much nicer than buying something. The best Apple Crisp in the world. Slice apples thinly and put them in a medium sized bowl. Sprinkle the sugar, corn starch, cinnamon and nutmeg over apples in the bowl. Mix until well combined. Transfer to a 9 x 13 pan that you've sprayed with non stick spray. Mix the flour, sugars, and butter in a bowl. Cut the butter into it with a pastry cutter or fork. It should look sort of like wet sand. Add the cinnamon and nutmeg. Mix again. Toss the topping over the apple mixture. Pop the dish in the oven and bake for about 35 to 45 minutes depending on your apple type and oven. I start checking at 35 but most times it's done in about 40. My Mom never used oats in hers that I can remember. My thought is one of us kids didn't like it so she never used it. Without it the topping tastes sort of like candy. it's spectacular. I promise better photos when I get a chance to remake this. So where did I go wrong with mine? Well I forgot to add the flour. I’ve made this dish a gazillion times and this is the first time it did not turn out. I opened the oven door to soup. I tried to salvage it. It worked taste wise, but the appearance is sort of horrible. I apologize and will take new photos when I remake it. In the meantime check out these other Sunday Supper recipes where people planned ahead! Thanks Ramona. I was so shocked I messed it up. Usually I can make it in my sleep. I was so thrilled to be able to bring both my folks some lilacs yesterday. I left huge bunches of them at the cemetery. Was a good day. I’m sure it still tasted good! Warm apples even in a “soupy” liquid would still be good. The pictures of you and your mom are great too! You are so sweet. You were such a great hostess. Thanks for such a great event. Thanks so much Jennifer. I appreciate it. Hope you had a great day as well. Ice cream solves most problems, I’ve found. 😉 I screw up all the time in the kitchen, but things usually work out (as they did with your apple crisp – that ice cream stuff!). Happy Mother’s Day! And thanks for sharing your mom’s apple crisp. Thanks so much John. You always make me smile. 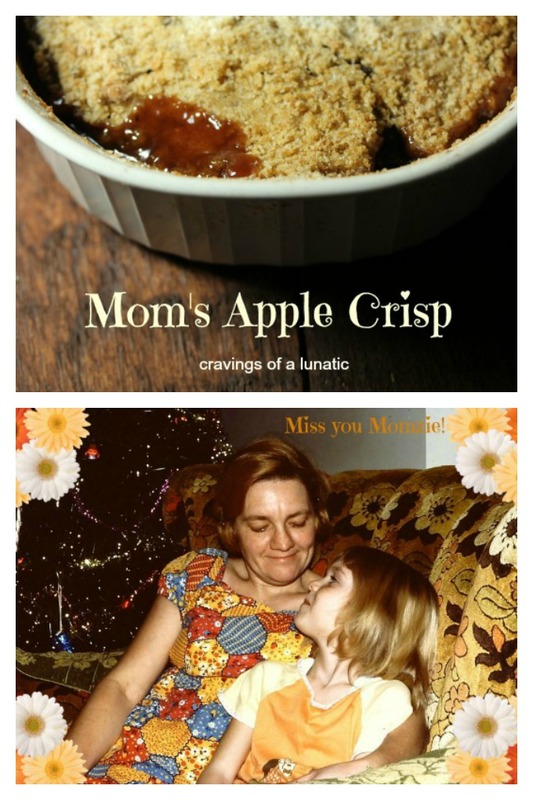 I miss my mom too and apple crisp was one of her favorite desserts to make! Big hugs to you Cindy. Apple crisp rules. Just something so comforting. about it. We all have baking fails sometimes! At least it was still yummy – that’s what’s important. And what a lovely tribute to your mom. She sounds like she was a great lady! Thanks so much Laura. You are so kind. Hope you had a great day. 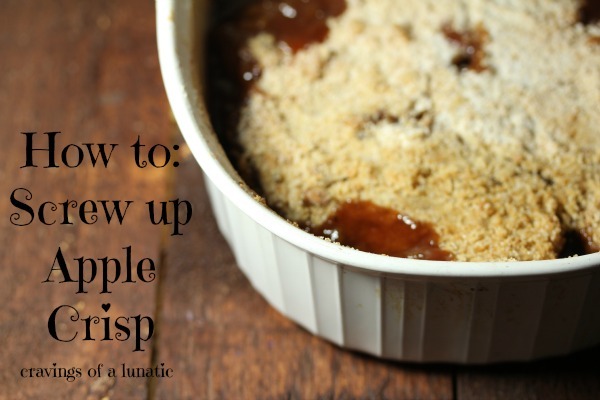 Apple crisp is the first recipe I learned from my grandmother. Whatever you missed from the recipe, it´s not showing. Nice tribute Kim! Have a sweet day! Thanks so much Paula. You are so sweet. Hope you had an amazing day. Thanks Kayle. Love ya woman. Thank you, Kim. Have a good weekend. Happy Mother’s Day! …and we all have had a WTH was I thinking moment in the kitchen, so don’t worry about it too much. Thanks DB. I was so bummed but it gives me a good excuse to make it again. Thanks so much Uru. Hope you’re doing well. Is school almost done for the year? Mine are done but they’re uni students so they always get done a couple months before everyone else. 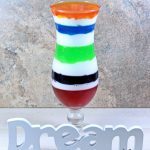 It looks pretty darn delicious to me!! Happy Mother’s Day Kim!! You must make it. Immediately. What a wonderful mother you had (have). Lovely story and photos too! Thank you for sharing your special apple crisp recipe from her; I can’t wait to try it this fall when apples are better for our region! Happy Mother’s Day to you Kim! Thanks Roz. I appreciate it. Hope you had a great day also. You have memories to last a lifetime of that wonderful woman. I would have done the same thing with those lilacs.. not for them because they aren’t here but for you. It keeps those memories alive. Thanks for sharing your mother’s famous apple crisp. 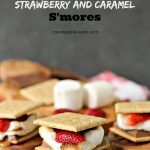 It’s one of my favorite desserts and honestly what can’t be made better with ice cream on top? Thanks so much Maureen. I was going to email you but I’ll just take a minute to say it here. I appreciate you so much. You are one of the most supportive people I’ve ever had the pleasure to know. I can’t tell you how much it means to me that you stop by with such sweet comments. I just wanted you to know that. I was thrilled to bring those lilacs for my folks. Perfect timing for the bush to bloom. Thanks so much Liz. I was so thrilled to see it bloom. Mom’s cherry blossom tree I planted in her garden did too but I was too freaked out about wrecking the tree to take any branches from it. Your Mom sounds like such a wonderful woman, and I adore that picture of you getting a cat – you are beyond adorable. 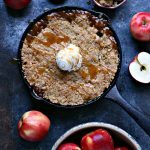 How disappointing to have this not work out, but it sounds amazing – I go crazy for apple crisp, but have never tried it without oats in the topping! If it tastes like candy, I’m game to try it. Thanks Anna. That was such a big moment cuz my dad hated cats. So me getting one was such a big deal. Thanks so much Soni. I miss her every day. Looks like a win of apple crisp to me, what did you mess up? A lovely tribute to your mom. Sending love your way. 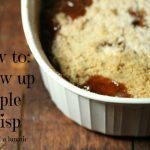 I love apple crisp! It’s always perfect with ice cream, no matter what! 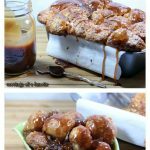 Thanks for sharing your mother’s recipe! Thanks Sarah. I just love this stuff. It’s such a big part of my childhood. I have definitely forgotten ingredients before, you are not alone! I have also lost track of cups and screwed up the recipe that way. Once I screwed up a cookie recipe but it turned out amazing….I have never been able to reproduce it since. Thanks Julie. It’s good to know I’m not alone. I also laughed at the cookie thing. I’ve done something like that myself with spices and it drives me nuts. Flour or no flour this was a truly beautiful post and I actually think the crisp looks pretty darn good! You can’t go wrong with sweet cinnamony apples and ice cream. Thanks for reminding me to squeeze my mom extra tight tonight. 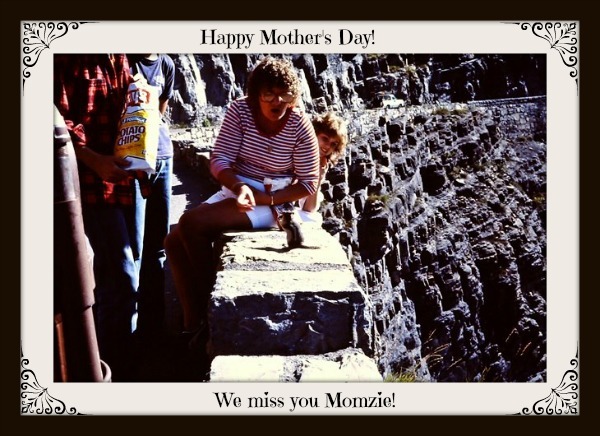 I hope you are filled today and always with sweet memories and the beautiful presence of your mom. Thanks so much Courtney. I hope you had a great day with your mom. What a lovely tribute to your mom, Kim! And it’s totally the thought that counts! I think we have all forgotten ingredients from time to time! This post was beautfiul… even if there was an oops. It still looks delicious and sounds incredible over ice cream! Thanks so much Isabel. It’s fabulous on ice cream. Sweet…your sentiment, and the dish! 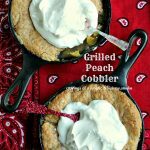 Great recipe for #SundaySupper! Kim, I knew I’d be teary eyed reading your post and as expected, I am. With every post you write about my mom, I can feel the love and admiration you have for her sizzling off my screen. 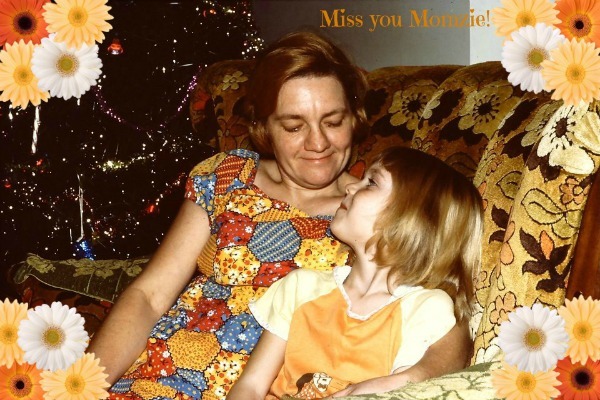 I can’t begin to imagine losing my mom at such a young age – I appreciate her every moment. 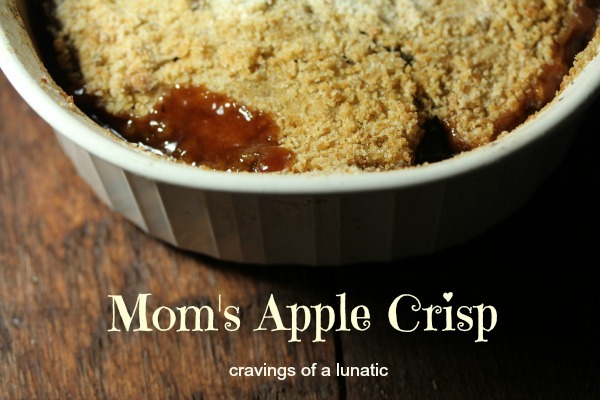 Even though you forgot an ingredient, you still made the crisp with your mom in mind so that’s what counts (plus, you’re totally right – ice cream makes everything better!). I hope you had a wonderful Mother’s Day of your own this year. Thanks for that Nancy. Sorry it made you teary though. I love to share stories about my mom, it helps me feel like she’s still changing lives even now. Oh no! i hate when I forget to add an ingredient in a recipe! I accidentally forgot to add eggs to my pancake batter one time and I could not for the life of me figure out why they were turning out funky. Ooops! I am glad your crisp still tasted good on top of ice cream – sounds yummy to me! Lol Katie, I’ve done stuff like that too. I guess we’re all human, is it sad my type A personality hates that? Oopsies!! Oh well, those things happen. Silly flour for not jumping into the bowl all by itself. 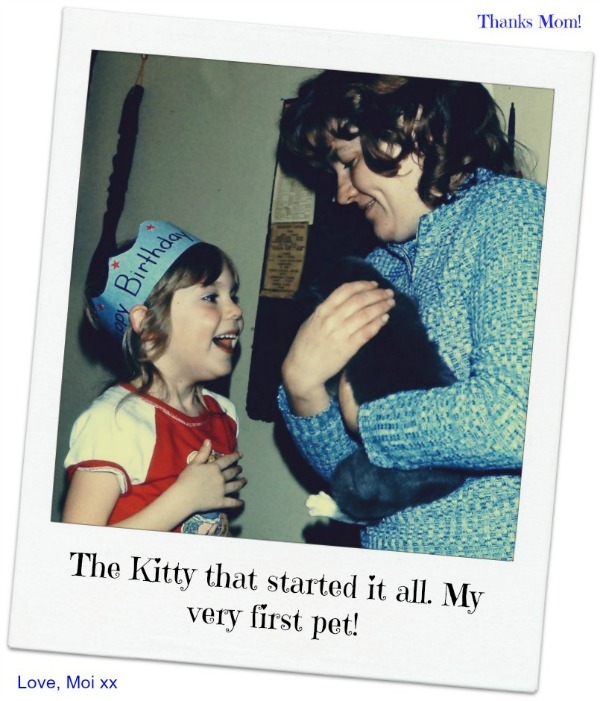 I love the giant smile on your face in the photo of your first cat. It made me smile just looking at it. I know right. Darn flour. Thanks Renee. I loved “kitty” so much. I was so creative with his name right. So true Terra. Thanks for visiting. Hope your mothers day, and every day since, were amazing. Haha, it totally happens, don’t worry about it! At least you saved it with ice cream 🙂 I had a friend once you forgot to put the sugar in pumpkin pie. That….couldn’t be saved! Thanks Lori. I bet that was one sour pumpkin pie. I think we all do it on occasion. Happens to everyone eventually.